The shoot: 1 year ago we held a colabourative shoot. A Festive soiree in the Orangery Was inspired by all things seasonal and wonderful full of rich vibrancy, opulent flowers and exciting glittery elements. A jubilant collection of colours moods and textured were evoked by the Christmas spirit and we really wanted to encapsulate the ultimate wedding inspiration for this time of the year. There has been a surge of winter Brides over recent years and collaborating with my friend Jane Beadnell photography we wanted to showcase the very best Yorkshire talent and what their wedding could be like when this theme comes together. The decoration, was beautifully designed an put together by Ambience venue styling York. The team worked a rich opulent burgundy, gold and red tonal colour pallet, there were tables laden with scented candles, extravagant golden cutlery and sequined tablecloths. There were met with stunning cakes by Zoes Fancy cakes which resembled the colour theme and were each hand adorned with colours and breathtaking artwork. Flower details to match were artistically provided by recognised Leafy Couture who crafted exquisite floral designs and table centres that were rich in colour, wonderful texture and omitted all the floral delights and scents of Christmas Magic. The location was perfectly chosen by Jane Beadnell photographer. We chose the Orangery at Setterington because it had everything we needed. We loved the large windows that drew in the cooling winter sun, stunning pillars that shaped the room and the warming glow of the muted colour palette. We were free to roam the grounds and were met with beautiful leafy arches artistic sculptures and marble structures. The Orangery at Setterington is a beautiful location in all seasons and we really wanted to showcase all that art, beauty and refinement that in our finished images. 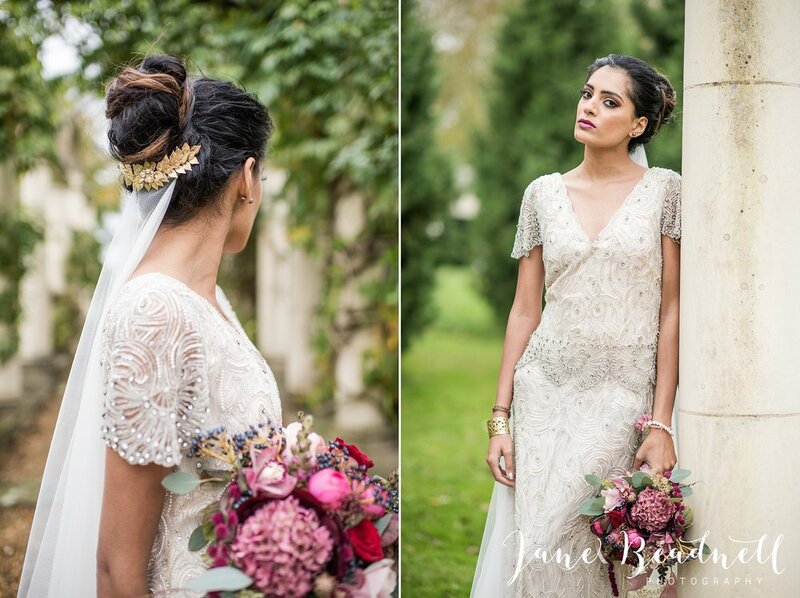 The Accessories provided by Award winning Bespoke Vintage Castle Beautifully who specially designed a collection of golden leafy laurels, and impecable swarovski headpieces exclusively for the shoot. Betty Timbo also designed a clutch purse which worked perfectly with the colour theme and added a hint of festive sparkle. Dresses were proved by the unique and amazing Bridal Emporium who are well known for their modern Bridal gowns and trendy designs. They did not fail to impress as the Bridal Emporium brought along the most elegant and graceful Designer Eliza Jane Howell Gowns. They were richly encrusted in jewels and set on fabric that moved and swayed as gently as the winter air.